The ultimate Adventure Time fan experience is coming to Australia! For the very first time,Adventure Time fans in Sydney, Melbourne and Brisbane will be transported to the Land Of Ooo with Adventure Time LIVE –an interactive, live audio-visual event featuring members from the all-star cast of the hit Cartoon Network series. Since Adventure Timepremiered in 2010, the Cartoon Network show has gained huge popularity amongst viewers of all ages for its unique brand of humour and animation style. The show has drawn in millions of viewers and dozens of illustrious guest stars, including George Takei, Neil Patrick Harris and Andy Samberg. It also famously inspired Hugh Jackman to lip sync the song “Bacon Pancakes”. It’s no exaggeration to say that over the last decade, Adventure Timehas changed the definition of what a kid’s TV series could be, and it’s had a resounding impact upon popular culture around the world, including Australia. 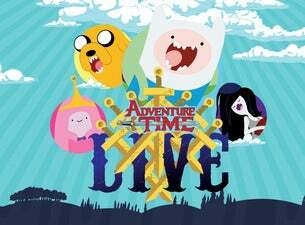 Adventure Time LIVE will bring this passion and creativity to life, offering everything that fans love about the show and its fantastical Land of Ooo. Taking part in a tour across the country, in three separate locations in March 2017, will be Jeremy Shada (the voice of Finn the Human), John DiMaggio (Jake the Dog), Olivia Olson (Marceline the Vampire) and Hynden Walch (Princess Bubblegum). Each event will feature a moderated discussion, live readings of classic scenes from the Emmy® Award-winning series, audience Q&A with the cast as well as musical performances. Other activities include Cosplay competitions, trivia games, art gallery, sponsor activations and more. Adventure Time LIVE is an exclusive event tailor-made for Australian fans giving them the chance to get the inside scoop. This is a must-attend event for any Adventure Time fan or cartoon lover! VIP packages will be available, granting ticket-holders unique access to a private pre-show party with the cast which also includes a one-on-one with each cast member. So c’mon, grab your friends, whip up some bacon pancakes and hang on for the ride!